West Worcestershire MP Harriett Baldwin has offered her continued support for a permanent flood protections scheme for Severn Stoke. And the MP has agreed to write to Environment Minister Therese Coffey to ask for help securing the funds needed to progress the important local scheme. Harriett joined local villagers at a public display of plans for the scheme and chatted to the Severn Stoke flood action group which was formed after serious floods cut off the village five years ago. The village has been seriously affected by flooding on several occasions in the last 20 years and the MP has worked with the local community and the Environment Agency to identify a plan to protect the village and the vital A38 road which runs through the village. Harriett has hosted meetings with the group and local land owners to try and secure permission to build the permanent defences. Harriett commented: “It is good to see the Environment Agency now publishing the formal plans for the scheme at Severn Stoke, which I know have been under development for some years. “The process to get to this point has been quite challenging and the local flood action group has worked very hard to keep the pressure on the EA and local authorities. “It is a very complex process because most of the land where a bund needs to be built is privately owned but I remain optimistic that this community-led scheme can progress. 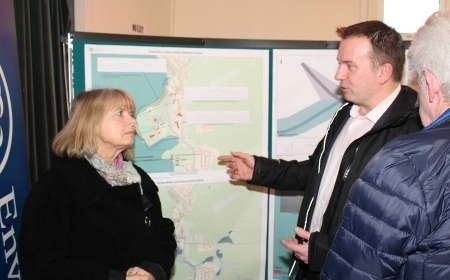 Photo: Harriett Baldwin MP (left) receives a briefing on the latest Severn Stoke flood protection scheme from the Environment Agency’s Richard Bentley.